So loose,,so free,,,so colorfilled,,,so YOU! I really like this piece and the words your wrote. What talent you have!! 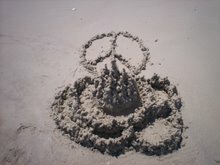 I hope you enjoyed a peace-filled 3-day weekend! The watercolors were a hand~me~down gift from my precious Joe, who even in his absence, seems to still fill my life...I spent the entire Monday Holiday sittin' Indian style on the porch floor, wading in paint, bottlecaps, markers....It was glorious! Todd....And your wonderful wish made it here on wings! Peace 2 U my friend.....keep sharing it, spreading it, knowing it! 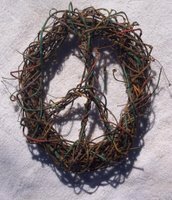 I LOVE your peace art! I like to paint peace too. I found you on etsy and came over here to check it all out. Glad I found you! Paula....Thank you, kindred soul! We are the new kids on the block in Etsyland and meeting wonderful, wonderful people! Your work is beautiful, beautiful, beautiful! Are you joining Peaceniks?